For years you have trusted ParentLife as the go-to source for Christian parenting advice for families with preschoolers and children. Now the ParentLife team is excited to announce a new and improved ParentLife launching in March. And you can glimpse a preview of the new design today! Check out our fresh, new March 2011 cover! Featuring a new logo, each cover will feature a moment-caught-in-time photo, real kids in real life moments. We hope each cover will make you smile and draw you inside for more. We have expanded our long-time favorite "Growth Spurts" section, now including information for expectant parents. Each “Growth Spurt” offers the best developmental advice for the whole child and a ParentLife best product recommendation. "A Life of Worship," ParentLife’s family worship and devotion department, now moves to the center spread of the magazine so it easily can be pulled out and hung on the refrigerator or somewhere visible in your home. 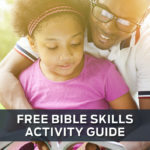 It includes family worship time plans (based on the LifeSpan concept Hear-Know-Do that ties in with Sunday School) as well as a calendar with extra on-the-go, everyday, worship times for families to use throughout the month. We are continuing our monthly departments "Real Life Solutions" with Dr. Linda Mintle, "Mom’s Life" with new columnist Angie Smith, and "Dad’s Life" with Carey Casey. We are committed to partnering with churches to provide the latest cutting-edge information that parents need as they seek to raise their children to the glory of God. Tell us what you think of the new design!